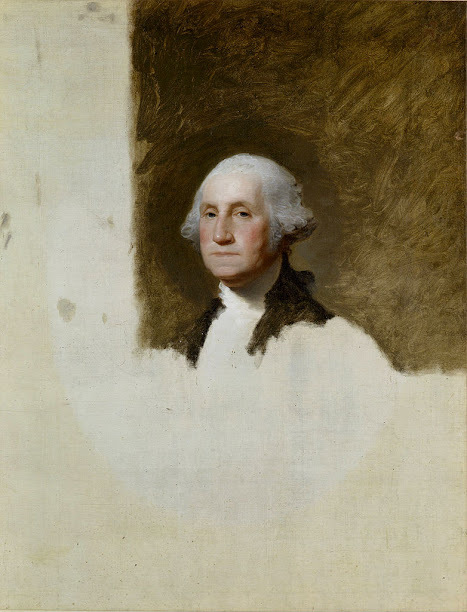 Not only has it been the portrait on the one-dollar bill since 1869, which makes it the most widely reproduced American painting ever, but it is also the portrait of which Stuart made and sold over one hundred copies in his career before he had even finished the original. Stuart kept it his entire life as a model for the copies, but it was still incomplete at the time of his death in 1828. This portrait is known as The Athenaeum because after Stuart died it was bought by the Boston Athenaeum, which is one of the oldest libraries in the US. Originally, “Athenaeum” was the name of a school founded in Rome in the 2nd century AD in reference to the city of Athens, which was considered to be a major center of intellectual life in the ancient world, and to its patron Athena, goddess of wisdom. The word was later taken up by institutions and libraries promoting literary and scientific studies. Hence the Boston Athenaeum. Other American paintings have been widely reproduced, but in terms of sheer number the portrait on the one-dollar bill since 1869 wins hands down, with between 1.9 and 5 billion new one-dollar bills printed every year since 1980 according to the annual production figures of the US Treasury, not to mention the previous 111 years, as billions of old bills need to be replaced every year.